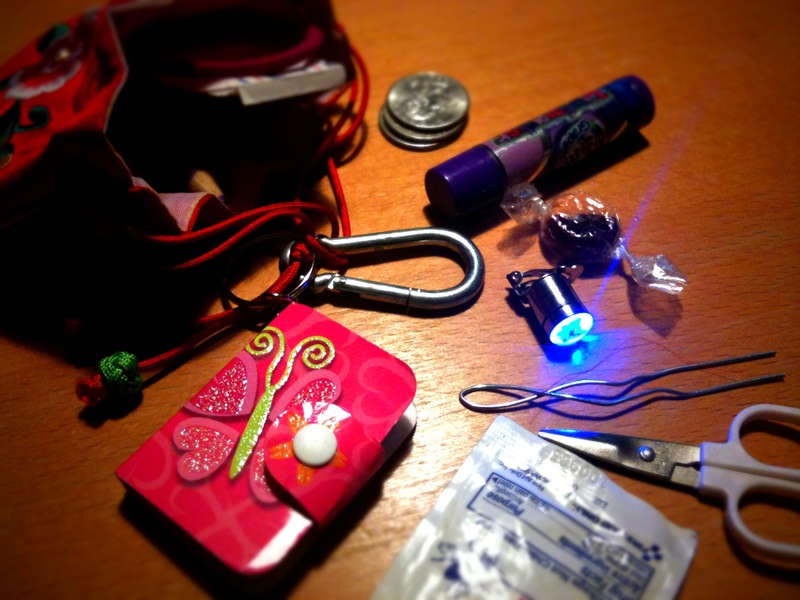 My youngest daughter has started carrying around what she calls a Survivalist Kit. Whatever the impulse, she has gathered an amazing array of resources that all fit magically into—or attach onto—a small, red drawstring pouch, about four-by-four inches. First aid supplies. String. Miniature working tools. Bobby- and safety-pins. Vitamin C and Fanta Grape chapstick. A very small strobe light. A needle, thread and scissors. A tiny notebook and pencil stub. Candy, quarters, and a miniature water supply, contained in a reclaimed 3.4-ounce Pure Michigan Maple Syrup jug. Everything is somehow bundled up and attached to her belt loop, and she’s ready to go. Except for the final two items she recently declared she was still missing: Her miniature book of prayers and some Tobasco Sauce. Because what hardship or unpleasant bind could not somehow be addressed with prayer or hot sauce? Just think—everything from seriously bland food to a run-in with the enemy could be handled with either prayer, hot sauce, or both. What happens to our Survivalist Kits when we grow up? I love this kind of intense imaginative play. It often crosses my mind how much I would have LOVED playing with my girls when I was 9 or 10. I realize many women would claim they carry such a kit with them every day, in the form of a purse. It’s true, we’re often well-prepared, but I would suggest that our imaginations are a bit too limited when we decide what should go into our purses. We don’t fully envision all of the sticky situations life might throw our way, beyond the unwelcomed headache or broken fingernail. Or maybe we carry many of the right tools but we are too traditional about how they can be used. Lipstick, for instance, is only thought of as something that brightens our faces, but couldn’t it also be used to mark a clue or leave a secret message?. And what about gum? Is it only a portable breath freshener, or also a handy adhesive? Or even a way to leave a signature scent trail? What happens to life’s challenges as we grow up? What I’m really finding, though, as I consider my Survivalist Kit, is this: For the most part, the world throws grownups curve balls that are just as unexpected as the ones in my daughters’ favorite books, but much less imaginative and adventuresome. My real-life plot twists come in the form of things like lost friendships, bouts of discouragement and flailing hope. Rather than picking locks or leaving clues I’m just feeling vaguely down as I go through a typical day. So maybe my Survivalist Kit would just hold a bunch of slips of paper, almost like fortunes. Each one would contain something loving and supportive my husband has said to me, a poem or drawing created by my daughters, an encouraging comment left on my blog, a quote by a favorite author, or one of God’s great promises. I think such a collection of words would see me through a lot—that and a prayer book and some Tobasco sauce, which never hurts. Your daughter’s are charming. Not the point of this post but I wish more kids were as imaginative as that. I mean to say “your daughters are charming”, not sure why the apostrophe snuck in there, one of my own pet peeves! I love the idea of a grown-up’s Survivalist Kit. Sometimes I think we already have it, in the form of unexpected snail mail cards from parents, or a supportive and encouraging online friend who Tweets you a message. Without even realizing it, we’re already receiving what we need to get us through the day. Meredith, you’re right! We do have a Survivalist Kit, we just don’t keep it all packed up and physically with us. Which means we also don’t get to control it, and the encouragement isn’t always there for us when we need it. That’s where we get to practice and develop concepts like faith and hope, I guess, holding on until that next bit of help arrives. Great post. I do in fact think that most of the time our purses are survival kits. From time to time I go through mine and I am amazed at the things I have collected inside. Then I go through a cleansing, back to a minimalist amount of items, only to return to a state where I am prepared for everything again! Ah Kristen, I love how you connect what occurs around you to something much bigger. I always figure I have my thoughts to help me survive what ever comes my way, no matter what I loose, as long as I dont lose my mind :-) I am well equipped to get through. We occasionalyften talk as a family about what to do in times of peril – talking physical survival now – but we remind each other that whatever is taken or gone, we have each other, and wherever we are can be home. As far as day to day ‘survival’, I try not to sweat the small stuff. We laughed recently as a family reading a list of 3 items someone wanted to bring to a deserted island – a power adapter was one. On a deserted island, where is power to be had? Better to have a sensible survival pack like your daughter’s.